Can antibiotics be used to cure an illness caused by a virus? Do viruses qualify as living things? They are much smaller and less complex than cells. They consist of either DNA or RNA enclosed in a protein coat called a capsid. They have no nucleus, cytoplasm, or membranes. They do not carry out cellular functions. Virons do not generate metabolic energy. They are obligate intracellular parasites, meaning that they require a host cell to reproduce. Temperate - not immediately disease causing. Viruses play a role in causing some cancers. A temperate virus introduces nucleic acid from its former host into a new host, thus changing the genetic code of the host. By this process of transduction, viruses cause genetic variation within a host population. Certain varieties of flowers have been developed using viruses to alter the genetic code. Characteristics used to classify viruses. 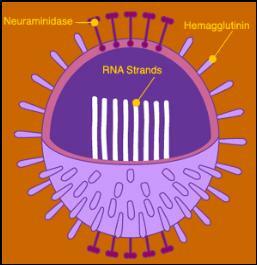 Type of nucleic acid: viruses have either single-strand RNA or double-strand DNA, but never both. Physical structure: viruses are found in several general shapes. 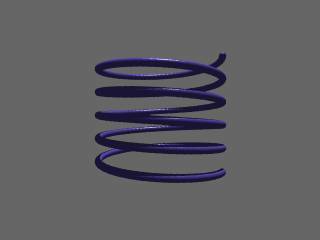 Helical/helix (the capsid resembles a coiled spring). *Knowing the structure of a virus gives hints about how the virus interacts with a cell to initiate the infectious process and how the structure of the viral proteins allows interaction with the immune system. From this information, strategies to abort virus infection might be advised. The diagram at the top of the page is a virus that commonly infects bacteria cells. This virus is usually referred to as a bacteriophage. Envelope: some viruses use lipids from the cell to form a layer around the capsid during replication. Type of host cell: most viruses are very specific about the type of cell they invade. 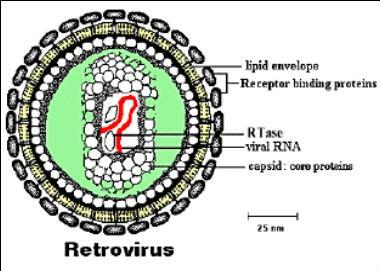 There are specific sites called receptor sites that the viruses attach to on the host cell's surface. All viruses invade a host cell and reproduce through one of these cycles. Attachment: Virus attaches itself to the cell. Entry: Enzymes weaken the cell wall and nucleic acid is injected into the cell, leaving the empty capsid outside the cell. Many viruses actually enter the host cell intact. Replication: Viral DNA takes control of cell activity. Assembly: All metabolic activity of the cell is directed to assemble new viruses. Release: Enzymes disintegrate the cell in a process called lysis, releasing the new viruses. 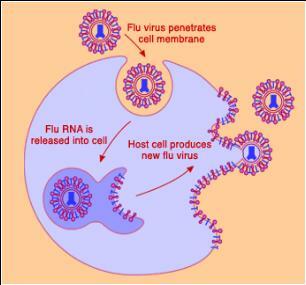 The virus attaches itself and injects its DNA into the cell. The viral DNA attaches itself to the host DNA, becoming a new set of cell genes called a prophage. When the host cell divides, this new gene is replicated and passed to new cells. This causes no harm to the cell, but may alter its traits. The prophage survives as a permanent part of the DNA of the host organism. 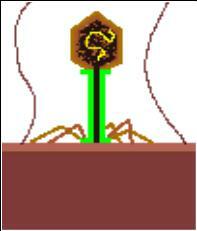 Some external stimuli can cause the prophage to become active, using the cell to produce new viruses. to explore a flu epidemic. 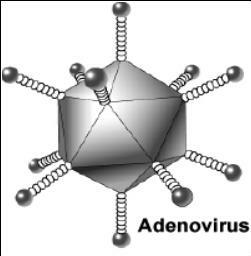 Viruses are very small, ranging in size from 20 nanometers to 250 nanometers. A nanometer is equal to 0.00000004 inch (4X10-8 in). The smallest of all bacteria is about the size of the largest virus. This picture shows round virus particles along with rod-shaped bacteria cells. Viruses are usually easy to destroy while outside living organisms. Outside the body, the "AIDS" virus, HIV, can be destroyed with a solution of bleach that is almost weak enough for you to drink. But once inside a host, most substances that destroy the virus are also harmful to the host organism. For this reason, viral infections in animal cells can be extremely hard to cure. Viral infections in plant cells are almost impossible to cure. Compared to the number of vaccines developed to treat bacterial diseases, there are very few vaccines for viral infections. 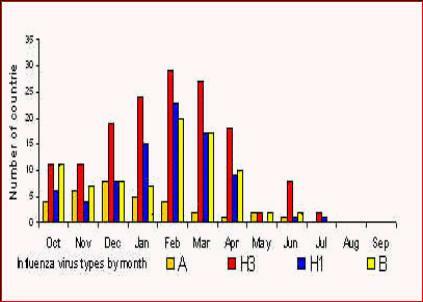 Virus vaccines are made with either inactivated or attenuated viruses. Inactivated viruses do not replicated in a host cell. Attenuated viruses have been genetically altered so they are not able to cause disease. The first viral vaccinations were for measles, mumps, and rubella. There are now vaccines for hepatitis A and B, chickenpox, smallpox, and rabies. Antiviral drugs interfere with the synthesis of viral nucleic acid or with the formation of viral capsids during replication. Antibiotics specifically attack the metabolism of a bacterial cell. Since viruses use only the reproductive machinery of a cell, antibiotics are of no use in destroying viruses. White blood cells engulf viruses in the blood and "digest" them. Interferon is a protein produced by cells when exposed to a virus. This protein binds to the cell membranes of neighboring cells and "interferes" with the ability of a virus to enter the cell. This assignment must be turned in by the end of class tomorrow to receive credit. How quickly can a virus replicate in a host organism? Complete the following activity to determine how many viruses an organism might be infected with after a half hour, after 2 hours, after 4 hours. Complete this virus replication worksheet & graph. Do you have the correct rubric, "paper rubric" for paper graphs or "Excel rubric" for Excel graphs? Remember, the rubric always goes on top, then graph, then worksheet. How are viral infections in plants usually stopped? 1. As you view part 1 of this video write down and answer the four discussion questions at the beginning of this part. Part B: Use this weeks information about viruses to answer the following questions. Are viruses considered living? Explain your answer. Describe how viruses are classified? List the names of 3 different types of viruses. What is the difference between a temperate and virulent virus. What is the lytic cycle? How is the lysogenic cycle different from the lytic cycle? Name 3 diseases caused by viruses and give a brief summary about each. Why is it hard to cure viral infection? Describe different ways we try to control viruses? Describe how your body might fight Viruses? 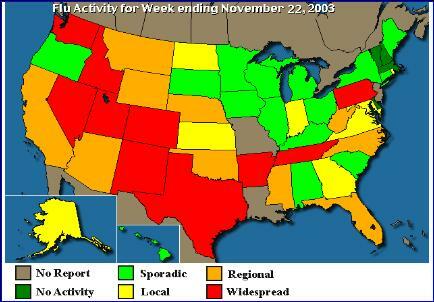 The flu is a contagious respiratory illness caused by influenza viruses. It can cause mild to severe illness, and at times can lead to death. While most healthy people recover from the flu without complications, some people, such as older people, young children, and people with certain health conditions, are at high risk for serious complications from the flu. Diarrhea and vomiting also can occur but are more common in children. These symptoms are referred to as "flu-like symptoms." A lot of different illnesses, including the common cold, can have similar symptoms. Some of the complications caused by the flu include bacterial pneumonia, dehydration, and worsening of chronic medical conditions, such as congestive heart failure, asthma, or diabetes. Children and adults may develop sinus problems and ear infections. The flu spreads in respiratory droplets from coughing and sneezing. It usually spreads from person to person, though occasionally a person may become infected by touching something with virus on it and then touching their mouth or nose. This assignment must be turned in by the end of class day after tomorrow to receive credit. 1. As you view part 2 of this video write down and answer the four discussion questions at the beginning of this part. 1. What is the name of the virus? 3. Is it a DNA or RNA type virus? 5. What type of organism does it infect and what part? 6. What symptoms does the virus cause? 7. 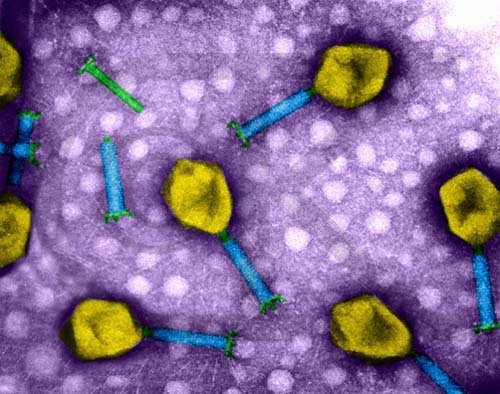 How does the virus replicate itself? 8. It what geographical region has it been found? Any area of origin? 9. What is used to fight back against this type of virus? Antibiotics have no effect on viral infections. Viral infections in plants are usually stopped by burning the plants to prevent the spread of the virus.